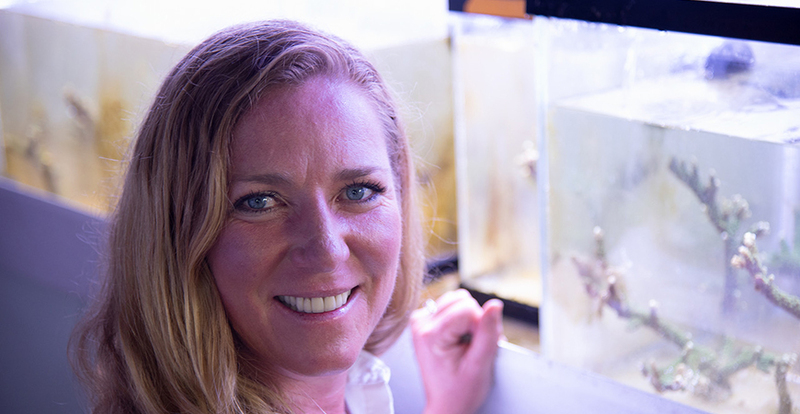 Jennifer Smith: I'm a marine ecologist and I spend much my time trying to understand what factors are important in structuring marine communities. I largely work in shallow coastal ecosystems so systems that require scuba diving in order to study them and primarily in warm tropical seas where you find coral reefs. JS: While it's often portrayed that every coral reef on the planet is going to be extinct in the next 50 or 100 years, in fact if you go to remote locations around the world, you find that there are coral reefs that are still thriving, coral reefs that still have excessive amounts of living coral, and we've seen evidence those systems can actually recover from disturbance events rather rapidly. Even though the media portrays coral reefs as these very susceptible and fragile systems, they have been around for millennia, so there's no reason to expect that with one disturbance event, they're going to fall off the face of the earth. We're really interested in trying to understand what makes these systems resilient, how can we try to build some of this resilience into other places where people live. How can we better manage fisheries? How can we better manage water quality to give these coral reef systems as much strength as possible to ensure that they can recover from future warming events, which is inevitable with climate change? Once we have the 3D models of a coral reef, we partner with scientists at UC San Diego’s Jacobs School of Engineering who have built custom software that allows us to actually move in that 3D space to extract data. This is really novel. There really isn't any commercially available software that allows scientists to do this so by partnering with these experts, we've been able to essentially extract data and information out of these 3D models that we would never have been able to do before. In this day and age with all of the technological advancements that are currently occurring, there's a unique opportunity for scientists to take advantage of some of these technologies and to interact and collaborate with partners and folks whom perhaps we would never have interacted with before. I was recently on a panel at South by Southwest talking about the use of technology for studying coral reefs and for coral reef conservation and it opened up numerous doors talking with audiences that I would have never interacted with on my own as a coral reef scientist and so that was really exciting to see the people that are building some of these technologies. People who are the forefront of Facebook and a whole variety of other media platforms are really interested in trying to help us communicate the coral reef story. Using social media in new and unique creative ways I think is really important for us as scientists to try to reach out and build a network to ensure that the messages are getting out to the public.